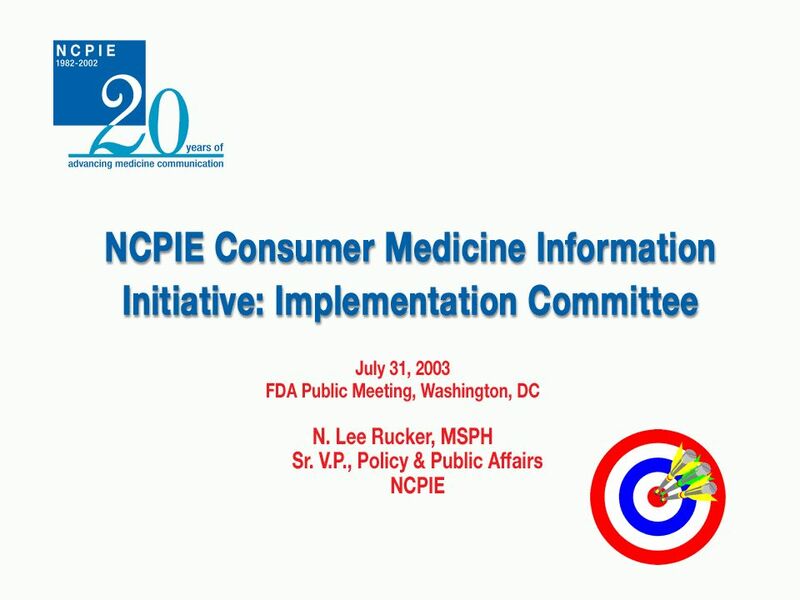 NCPIE CMI Initiative. Implementation Cmte. 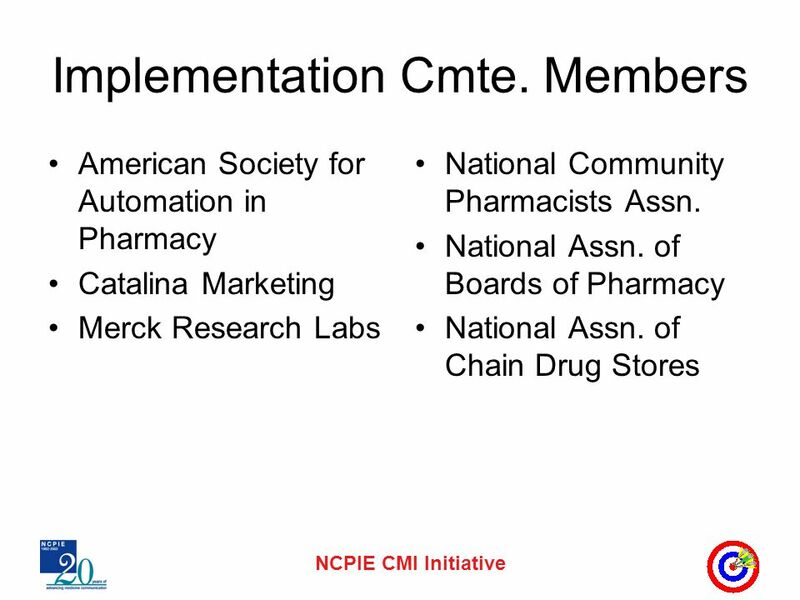 Members American Society for Automation in Pharmacy Catalina Marketing Merck Research Labs National Community. 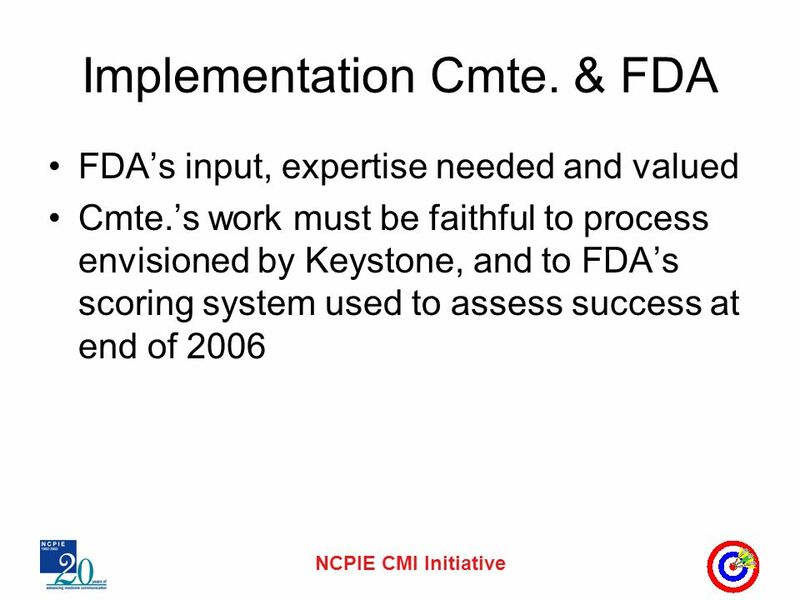 Download ppt "NCPIE CMI Initiative. 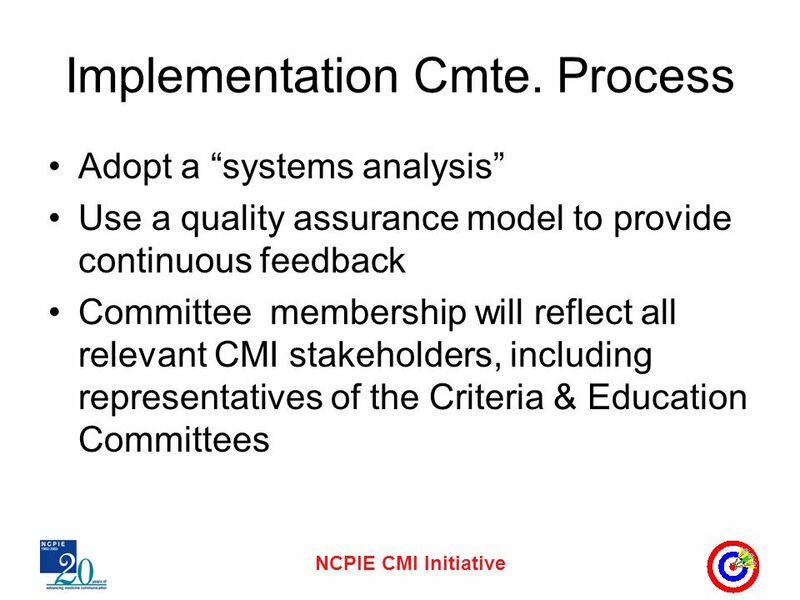 Implementation Cmte. Members American Society for Automation in Pharmacy Catalina Marketing Merck Research Labs National Community." Prescription Drug Information for Consumers and Healthcare Professionals 48 th FDLI Annual Meeting Washington, DC Wm. Ray Bullman Executive Vice President. 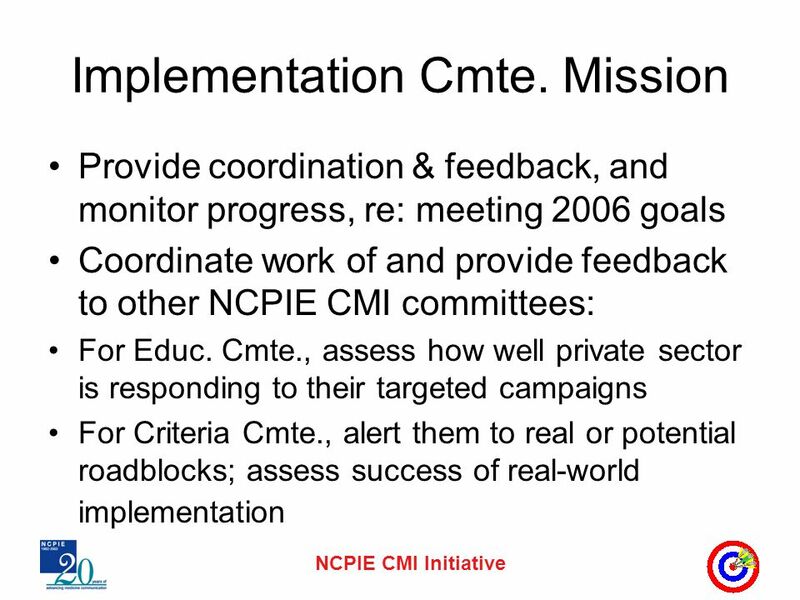 NCPIE CMI Initiative. Criteria Committee Members American Society of Health-System Pharmacists Catalina Marketing Cerner Multum First DataBank Medical. 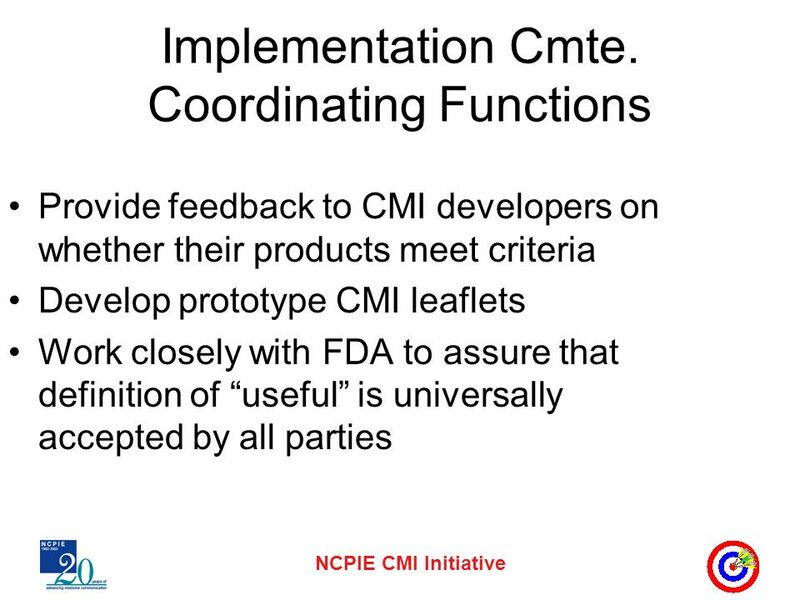 NCPIE CMI Initiative. Education Committee Members American Pharmacists Association First DataBank National Assn. of Boards of Pharmacy National Assn. 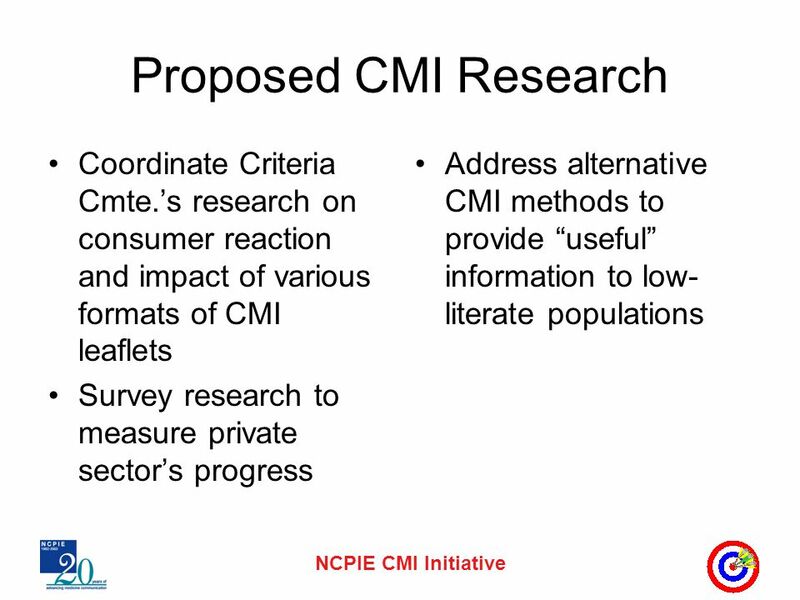 NCPIE CMI Initiative. Goals Letter of the Law –Fulfill promise of the Keystone process Spirit of the Law –Provide useful information for low literate. National Accessible Reading Assessment Projects Goals of Project NARAP Collaboration General Advisory Committee Project Details (ETS and PARA) Plans for. Assessing Primary RE in Higher Education An opportunity to: o talk about and share your professional expertise and practice in RE o reflect on: -issues. Module 4 Planning SP. What’s in Module 4  Opportunities for SP  Different SP models  Communication plan  Monitoring and evaluating  Working session. 1 Auditing in the Public Interest Records Management in the Victorian Public Sector Audit objective Audit had two objectives : The first objective was.  1. Goals and Objectives  2. Appropriateness of Project Design  3. Coordination with Related Efforts  4. Consumer Involvement  5. Methodology 1. A plain English Description of the components of evaluation Craig Love, Ph.D. Westat. Exploring Collaborations: Successful Strategies for Increasing Equity and Access to STEM Strategy Session 1: Overview and Game Plan 1. Community Governance Consensus Based Governance RECOMMENDATIONS. Basma Y. Kentab MSc. Department of Clinical Pharmacy May 2014. Habitat for Humanity of Dane County Organizational Strategic Plan Adopted April 16, 2013 Our Families Our Community Our Society Mission VisionValues. 2009- 2012 Presentation to Membership. A Recap of Our Process February 2009: Decision to renew strategic plan March 2009: Engagement of Berlin, Eaton.